Crete has never really regarded itself as part of Greece. It has a character of its own and the Cretans are proud of their heritage and history. As we say in our brochure’s opening description of Crete: “the most striking aspect of this land is its people. Shaped by centuries of struggle against oppression, they are as rugged as the mountains, fiercely independent and passionately loyal to Crete and one another”. They also feel that their cuisine epitomises what is now known as ‘The Mediterranean Diet’ which brings good health and longevity. Olives and olive oil, herbs, home grown fruit and vegetables and traditional dishes are very much a feature of the Cretan lifestyle. This itinerary covers two very different parts of Crete, the more populous and flatter north coast and, cut off by the mighty White Mountains the more rugged and inaccessible south. On arrival in Chania you will be transferred to the Doma Hotel, a welcoming property we have featured since 1976, which combines comfort with an old-world elegance. Owned and personally run by two sisters, and in the family since 1930, the Doma used to be the British Consulate and is a 10-15 minute walk from the Venetian harbour. 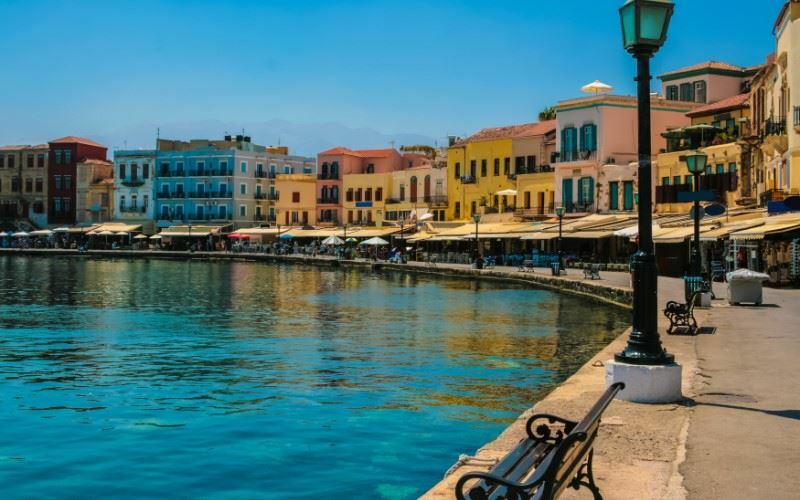 Chania is one of the most beautiful cities in Greece and the Venetian harbour with all its restaurants, tavernas and bars is the place to be - especially in the evenings. Get off to a flying start by having your evening meal at the Tamam restaurant, located in a 15th century Turkish steam bath building and founded as a restaurant in 1982. They serve excellent traditional Greek dishes with a Turkish eastern European twist using local ingredients. Overnight at the Doma Hotel. Chania is a fascinating city and it is well worth exploring all the narrow streets and small shops. For lunch try Thalassino Ageri Vivlaki close to the Doma Hotel in the old Halepa district of Chania for fish. This is where locals eat and the views over the sea from the restaurant are lovely. You will need a long siesta and probably won’t need an evening meal but again the harbour for an evening of people watching along the front followed by a light snack - though light snacks often end in big meals in Crete! Your car will be delivered straight after breakfast or whenever you choose to take it. Today visit the traditional village of Vamos, just a 40 minute drive away along the good north coast road and then a short distance inland. Spend the morning wandering around the village. Lunch should then be in the traditional taverna of Sterna Tou Bloumosifis. Here you will find excellent Cretan dishes made with local ingredients and cooked in local virgin olive oil. They also have a good selection of Cretan cheeses (try Kefalotiri) and Cretan wines. It’s the harbour again for your evening stroll and people watching. Today you can either go east or west. An hour’s drive to the west brings you to an area that is wild and lesser visited called Falasarna, right at the far end of the island via the small market town of Kastelli. Falasarna has a very famous beach, usually relatively sparsely populated and overlooked by a handful of really local tavernas. To the east is the third largest city in Crete, Rethymnon, which is also a one hour drive. Like Chania, Rethymnon bears many Venetian influences and you can easily spend the whole day exploring the city. Try the Castelo restaurant in the heart of the old town for bags of character and outdoor seating. Of course our local reps Linda and Chrissy in the Chania area can make any number of recommendations. Linda claims that she can point you in the direction of a very local taverna with excellent Greek cooking where you would pay no more than €10 each with drinks and starters as well as a main course! She maintains that the main courses are €4 each. Put her to the test for your evening meal! The drive from Chania to Paleochora for the second centre of your trip will take one and a half hours (71 km) if you went straight there. However, don’t be in a rush because this is a very scenic drive across the White Mountains which rise to over 8,000 ft. Stop for a coffee and a ‘spanakopita’ (spinach pie) and admire the views. In the evening join the throng on Paleochora’s main street to people watch and to eat in one of the many tavernas, cafes and restaurants. Overnight at On The Rocks Hotel. Paleochora is for swimming and walking amongst the dramatic scenery, and for snacking at Vakakis Family Bakery right on the seafront. The bakery is the centre point of this village and quality is truly great. It all happens on the main street in the evening when the road is closed to traffic and there is a lively cosmopolitan atmosphere which characterises this rather cult resort village. The main beach stretches for nearly a kilometre and is of fine golden sand; and behind tower the White Mountains. Your hotel is literally on the rocks but you are only a minute’s walk from the many cafes and restaurants and the beach is a five minute stroll. Our rep Leslie has lived in Paleochora for many years and will give you the latest information as to where to eat. 2 overnights stay at On The Rocks. Make sure you allow plenty of time to drive back to the airport to return your car and to catch the flight back home. You will find the north coast rather tame after having been in Paleochora for three nights. This most civilised hotel combines comfort with an old-world elegance and has been featured several times in ‘The Good Hotel Guide’. This most civilised hotel combines comfort with an old-world elegance and has been featured several times in ‘The Good Hotel Guide’. It used to be the British Consulate, and stands across the road from the sea 1 km from the centre of town and a 10-15 minute walk from the harbour. You can swim from almost below the hotel (note: rough path down) and a five minute walk brings you to a safe (albeit) narrow sandy beach. Personally run by the genteel sisters, Rena and Ioanna whose family home this once was, the hotel is full of antiques, family heirlooms and photographs, historical prints and generally fascinating Cretan ephemera collected over many years. It has 20 rooms and 4 suites, all with air-conditioning, ceiling fan, TV, safety deposit box, hairdryer and shower/wc. Those at the front have good sea views but no balcony and are above a busy road; we favour those to the rear which have a balcony overlooking the small attractive garden. The hotel also has three first floor suites and a very private Penthouse Suite which has a huge roof-terrace to itself and panoramic views to the sea and old town. On the third floor and served by a lift is a beautifully decorated breakfast room with wonderful views over the sea to the harbour. To the rear of the hotel there is a small ‘secret’ garden littered with pieces of pottery and sculpture. Note: Our rooms, unless otherwise requested, will be to the rear of the hotel with balcony and garden view. Good name! This smart modern little hotel is indeed almost on the rocks above the sea just to the south of Paleo's jetty, and looks east to the ruggedly beautiful coastline here. The hotel has 16 rooms on its upper floors, all served by a exterior glass lift. Rooms have a cool contemporary design. All have free Wifi, TV, mini-bar, hairdryer, shower room and balcony with exquisite sea and coastline views. The ground floor houses reception (safe facilities here), lounge and café-bar. You will find an array of seafront restaurants starting just a minute's walk away, and the big sandy beach is 5 minutes. Due to the generally flat nature of Paleo and the fact that the hotel has a lift, On The Rocks would be a good choice for those with mobility problems.